They are not a big scouting report team. If you work on the actions that you are going to see throughout the season, you don't need to spend a lot of time in practice on other teams plays. 1 passes to coach, defenders shift. 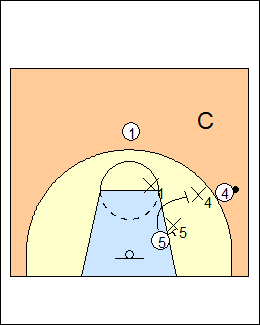 4 cross-screens for 5, a defender getting screened always has to go over the top, they don't want to foul. X4 can't leave until X5 crosses his face. 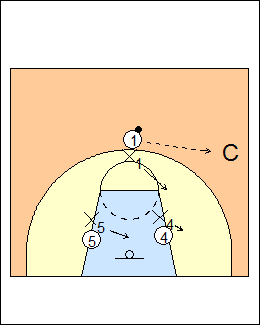 See Defence - Messina off-ball screens, Defending - Diamond drill. 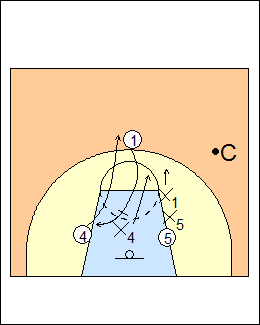 X5 is 3/4 high side in the post, X1 is in the gap. When 1 downscreens, X4 can go ballside (shown) or manside (trail the cutter). X1 extends the screen. 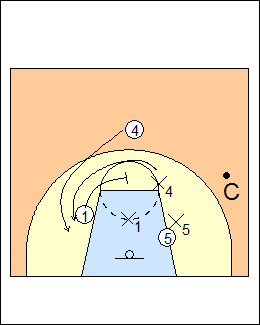 See Attack/defend - 3 on 3 cross-screen downscreen, Rebounding - Triangle screening. 1 continues into a flarescreen for 4, X4 chases over the top (always). X1's job is to stay in a straight line with the screener (between 1 and the basket) to alleviate a slip, force the cutter right at him, and a pass to 1 going backwards. Turn it into a beat-the-screen drill, 5 baseline screens for 4. Every time we are beating a screen we have to get below his hip. 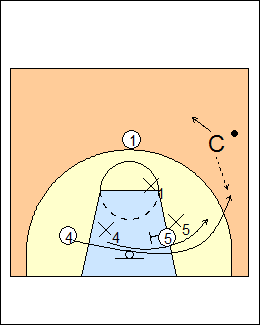 Coach passes to 4 and moves away. Finish working on pick and roll, not playing it live. See Defence - Woodley ballscreens, Defending - Woodley 2 on 2 ballscreens.